The 2015 National Occupational Research Agenda (NORA) Symposium was held Wednesday, May 6 at Mayo Memorial Auditorium at the University of Minnesota School of Public Health. The symposium was co-sponsored by the Midwest Center for Occupational Health and Safety (MCOHS) and the Upper Midwest Agricultural Safety and Health Center (UMASH). 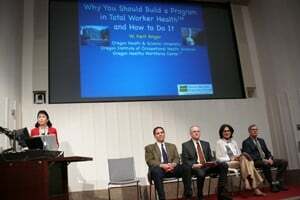 Attendees from diverse backgrounds including healthcare, occupational health and safety, education, research, government, communications, labor relations, and human resources gathered to discuss “Total Worker Health”. Thank you to all who made the 2015 NORA Symposium a success! The body of the featured footer goes here.